"... The second morning we broke down our tents, had a good breakfast with improvised coffee, and headed for Tsavo West. Again we had to drive for hours to get to Tsavo West. The landscape was indeed much more versatile, with hills and valleys, rocks, dense vegetation, water etc. This day we were lucky and spotted a whole pride of lions, about 10 animals, at 80 meters distance. They were lying in the grass, but a few of them would get up and walk around. We stood there for about 20 minutes, looking at turns through the 2 pairs of binoculars we had brought. It was pretty fascinating. 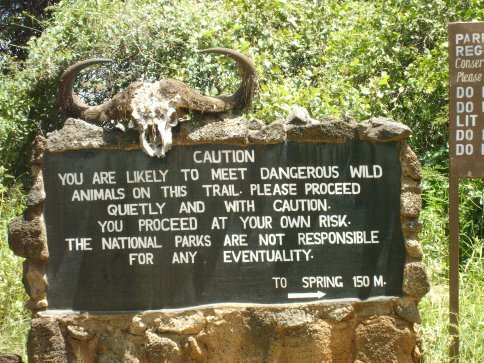 We also went to the Mzima Springs, where we talked to the park rangers dressed in camouflage uniforms and armed with AK 47 rifles. We walked down to the pool, where a whole group of bathing hippos were. 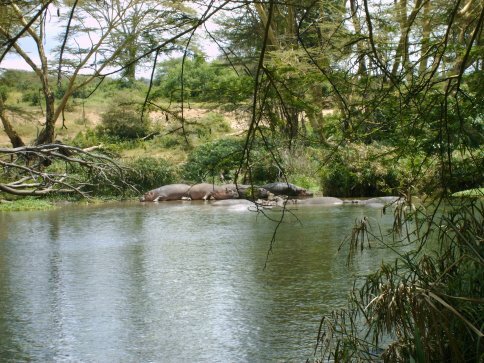 We were told that hippos kill the most humans of all wild animals in Kenya. They are not big fat friendly animals. There was a pool crocodiles too. There was a nice underwater viewing chamber, but sadly no crocodiles there to see, only fish (but very beautiful ones). We met some Californians there who had worked in East Africa for a long time for the US Peace Corps, and who spoke fluently Swahili. It was nice to hear their stories about Kenya and about Californian politics. I still had quite heavy stomach cramps so I stayed in the van half of the time. On the road back to our cottage, our friends wanted to visit a Masai village. The driver took us there. But after arrival, some young Masai men came up to us and explained that we had to pay 4000 Kenyan shillings (about $60). As my friends from Germany were very principled, and not very rich, they refused. They offered something which they thought was reasonable, and made we would politely leave if they wanted more. But the Masai kept asking 4000 shillings, saying their elders did not allow them to settle for less, so we got in the van and drove off. We arrived at 11 PM at our cottages, totally exhausted.